K&B Molded Products’ insert molding services are backed by a culture of quality, and a 50-year history of engineering precision injection molds and related tooling. Insert molding is the joining of two different components to create a single, integrated part. By using insert molding processes, we are able to take a metal assembly such as a wire form or stamping, and directly mold the plastic component onto the part. This is by far the most efficient and reliable way to add handles, grips, or other part features to machined or cast components. Rather than having to leave a gap in the plastic molding and then assembling the plastic part using adhesives or fasteners, the plastic is adhered to the metal in a manner that results in a solid assembly with no voids. Not only does this result in a higher quality part, it reduces the number of production and assembly steps required to achieve a finished product. 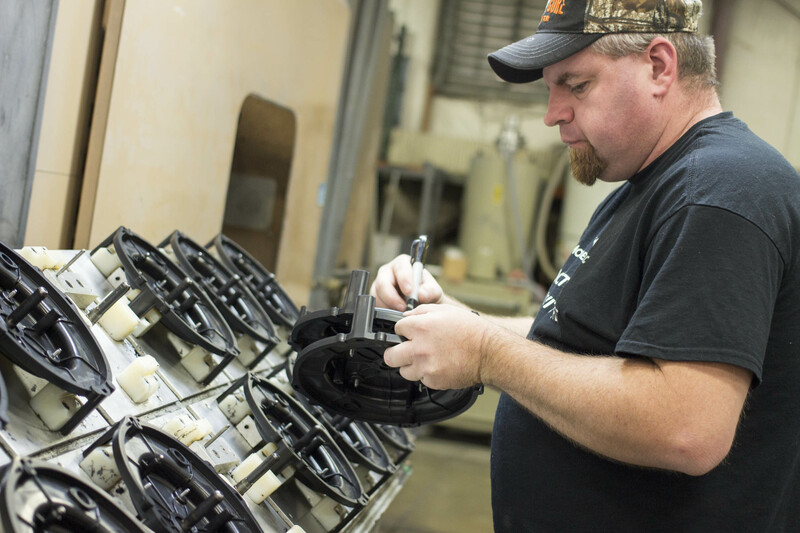 When you work with K&B Molded products on an insert molding project, you’re tapping into a network of experienced engineers and access to a range of molding presses from 66 to 730 tons. By offering a wide range of press equipment, we can efficiently handle multiple different part types, sizes, and volumes. The clamping force required to produce an overmolded assembly is based on the size, shape, and material of the assembly as well as the number of parts that are molded in a single cycle. After the assembly has been molded additional components can be soldered or assembled to the product as needed. Additional secondary services such as decorating, packaging, and order fulfillment are also available. In insert molding, material compatibility is critically important. Thermoplastics all experience some degree of shrinkage upon cooling and accurately accounting for this is essential to the design of the insert molding tooling and production process. 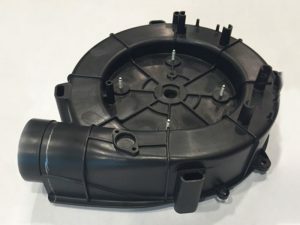 Our combination of experience in precision mold design and fabrication as well as in the actual injection molding process allows us to fine tune all parameters related to the overmolding process to the specific component in question. The result of this diligence is a premium quality, long-lasting molded assembly that meets all strength requirements and dimensional tolerances. We serve a wide variety of customers including those in the marine, HVAC, and aerospace industries. These industries require high quality parts that meet stringent quality specifications. Components such as fan impellers and other rotating machinery components must be precisely molded to ensure they are properly balanced. Pump components cannot have any internal voids that could lead to premature rupture when the fluid handling system is pressurized. Most of our new customers have come to us directly as a result of referrals by current customers. We take pride in the reputation we have established through 50 years in the injection molding and mold making business, and continue to explore new opportunities that help grow our business and help customers succeed in theirs. 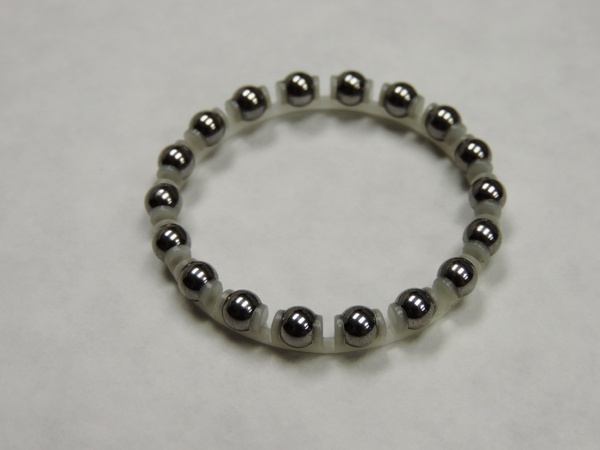 Converting a hand assembled product to an overmolded part can prevent quality issues and provide significant cost savings over the life cycle of a product. Our quality management program is ISO 9001:2008 certified and dictates all work procedures and continuous improvement efforts throughout our facility. In-process inspection, standard work procedures, and quality testing, are all used to verify that all products conform to customer specifications.